Organic always and made with only real food. 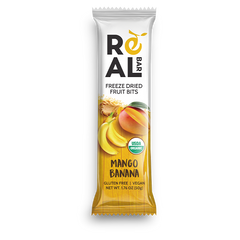 RealBar Strawberry Banana is a Real Raw Cold-Pressed bar that is Vegan, Gluten Free, Non-GMO, and Kosher. 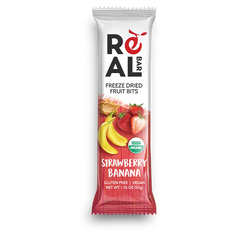 Cashew butter and date based with freeze dried strawberry and bananas this snack bar will satisfy your hunger, taste buds, and at the same time provide essential fuel that your body will love. Ingredients: Organic Cashew Butter, Organic Tapioca Syrup, Organic Date Paste, Organic Cashew Pieces, Organic Pea Protein, Organic Freeze Dried Strawberry, Organic Freeze Dried Bananas, Organic Quinoa Crisps, Organic Cacao Nibs, Organic Chia Seeds, Organic Mixed Berry Flavor, Organic Banana Flavor. Ingredients: Organic Cashew Butter, Organic Tapioca Syrup, Organic Coconut Flakes, Organic Date Paste, Organic Freeze Dried Pineapple, Organic Prebiotic Fiber, Organic Cashew Pieces, Organic Cacao Nibs, Organic Pea Protein, Organic Pumpkin Seeds, Organic Coconut Flavor. 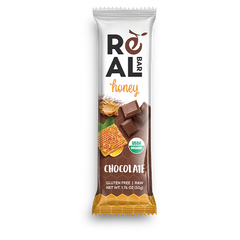 Ingredients: Organic Cashew Butter, Organic Date Paste, Organic Tapioca Syrup, Organic Cashew Pieces, Organic Prebiotic Fiber, Organic Pea Protein, Organic Freeze Dried Banana, Organic Freeze Dried Mango, Organic Quinoa Crisps, Organic Cacao Nibs, Organic Chia Seeds, Organic Banana Flavor, Organic Mango Flavor. For Updates, Special Offers, and More. COPYRIGHT 2019 Organic RealBar, all rights reserved.